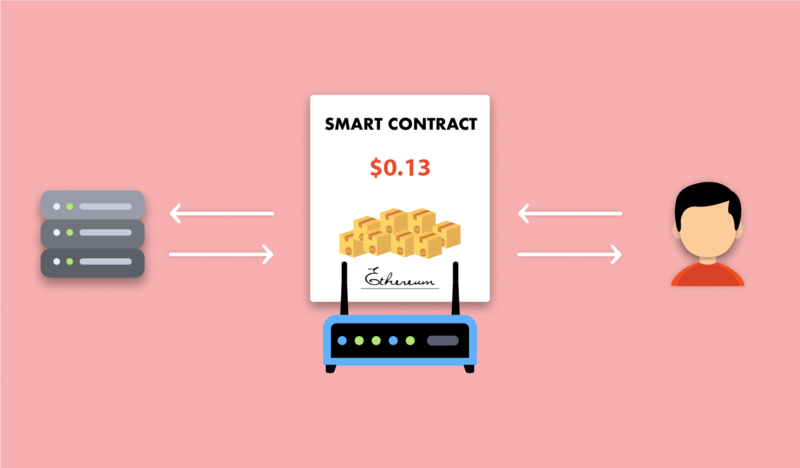 In our previous blog post, we mentioned that we’ll be writing about systems that can employ Smart Contracts as part of their business. In these systems of IFTTT, the first T is imperative. If “this” happens, then that happens. Many corporate lawyers make a living establishing what “this” is. That’s why “robots” were previously mentioned, they carry out IFTTT contracts between individuals. We already have systems that we have built ourselves that are essentially robots. This blog post is about the biggest robot of all: the internet. Fundamentally, the internet is an information exchange system. More specifically, it is an extremely quick and complicated messaging tool. In the past, if you wanted to send a selfie, you first had to commission a painter, pose for a few hours until the painting is finished, mail it to the other side of the world, and hope the painting isn’t lost in transit. What the internet does today is essentially the same action, except the internet sends data packets through a system of wires and/or microwaves. These data packets sometimes get lost as well (because even computers aren’t immune to the laws of physics). To facilitate the internet, a system of robots were built that read data packets and their addresses, and then send (or transmit) these packets on to the next robot until they reach their final destination. Anytime you run a tracert on Command Prompt you’re reminded of this. Well, over the course of building a network as complicated as the internet, a feedback system should be implemented. This feedback system allows you to see what you’re doing, and determine if it is being done correctly. The internet’s feedback system is the wonderful and sometimes dreaded concept of logs. Yes, today’s equipment can log anything and everything. Where would intelligence agencies around the world be without logs? Modern internet robots can log anything, and they usually do, especially when it comes to volume. Robots count each data packet they process, allowing users to know exactly how much work one robot did. Unfortunately, robots don’t get a cookie for a job well done. How would ISP’s use Smart Contracts? ISP’s could use Smart Contracts to create and offer extremely affordable pay-as-you go internet service, allowing you to pay for each data packet you transmit and/or receive. This is already standard practice with electricity, water, and gas, so why not the internet? Instead of offering ‘speed’, internet service providers could offer amounts. Many ISP’s already offer a set amount of internet with each monthly payment, and usually reserve the right to cut you off if you abuse it, so this would be a more transparent offer. Many countries consider the internet a ‘utility’, and it is currently a highly debated issue in the United States. For example, the electricity distribution company periodically comes to your house to read the meter and determine how much electricity you consumed, and then they send you a bill. The electricity distribution company keeps a small amount of the money and the rest is sent to your chosen (or imposed, or only) electricity generation company. The same concept applies to gas and water, but with the internet, it can be much more. Since modern network equipment keeps logs, we can use smart contracts to actually pay the companies that receive or send data packets. Imagine you waste most of your internet watching Netflix. That would mean the company that is sending you those entertainment data packets for streaming Mr. Robot in 4K deserves to get a portion of your internet payment. If you’re reading this, then Bitsapphire may be able to generate a micro amount of money by providing you with your data packet information. This would democratize EVERYTHING. Also, it would ruin the advertisement industry. Perhaps, Medium.com would finally have a business model and survive. Of course, anyone handling data packets would take a percentage of the fee. Everyone would, however, only pay for what they use. Instead of paying $50 a month for not-so-fast internet speed (which is the reality for most of the US), everyone could have the fastest speed and only pay for what they consume. If the internet is really a utility, then the network should be used at its fastest capacity to deliver as many data packets as quick as possible. Anyone in the network that loses a data packet literally loses money. People don’t pay different rates for different electricity frequencies. Everyone gets the 50 or 60 Hz that they need, at the per kWh price they agreed upon. The same applies to water use and fees, people pay the same amount per gallons/liters of water independent of the pressure they receive. This smart-contract-enabled internet could lead to other changes as well. For example, the closer a set of data is to its endpoint, the cheaper it would be. Wonderful for local businesses, but not that great for globalization. Unless, the global community agreed on a per data packet rate, that way price would be the same independent of location, and local content would be more profitable. An agreement like this could potentially fuel efficiency. Depending on the relevant calculations, we could reduce the number of abnormally large server farms that host everything or smaller cluster farms that host regionally relevant data (which is more or less the current state). A smart contract enabled internet will also prompt people to use the internet more efficiently, which is good for the environment, but bad for our binging habits. Users that gorge themselves on content and are psychologically dependent on media will have to re-evaluate their lives. Users could also set up alerts so they don’t spend all of their money on internet usage, while other people that consider the internet a non-necessity will have more money at the end of the month. Finally, if the world can agree, free internet zones such as libraries could be implemented. Internet providers would agree to handle data packets for free in these areas. Some free internet zones could even become ISP’s, using the money they earn providing their service to offset the price of giving access to library card holders. The possibilities are endless. Internet service providers, in the broadest definition of the word, would become just that: companies that provide the internet. Smart contracts in a capitalist driven world make the world more interconnected. Communication would be paid for fairly and efficiently. That is, of course, unless network equipment is tampered with and data packet processing is not reported correctly.